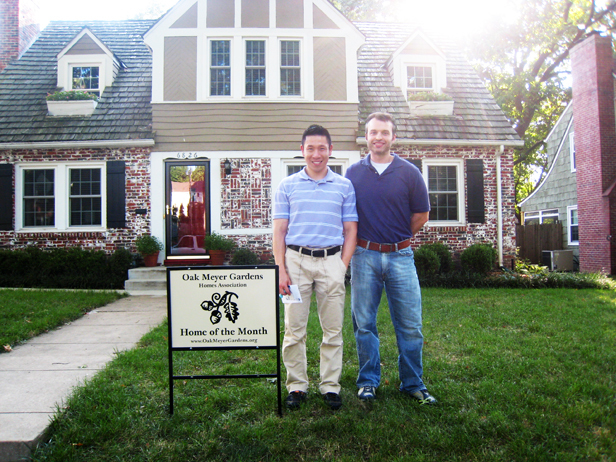 The Home of the Month award for August 2011 was recently presented to Danny Chong and Adam Splitter at 6826 Cherry Street. The Home of the Month award is presented to Oak Meyer Gardens residents who take exceptional pride in the outward appearance of their home and property. Danny and Adam were nominated for the award by a neighbor, who said she is especially impressed with all of the work they do in the back yard. In addition to being recognized for their efforts, Danny and Adam were presented with a $25 gift card donated by our award sponsor, Euston’s Waldo Hardware, located at 126 W. 75th St.